It’s easy to get lost when you are a kid. I learned my way around the neighborhood just fine but outside of that it was a mystery. I think part of it was whenever I went more than a few blocks from my house I was accompanied by an adult. I didn’t actually have to know where we were going. Someone else was handling that. I actually remember one time when my dad was driving me somewhere, I asked him “How do you know where to go?” He laughed. “You’ll figure it out eventually. And he was right. Was he on one of those blended-wing-body aircraft no one seems to want to build? Or, being Biff, did he manage to get lost in a one-lane airplane? embarrassed as I am asking questions, what’s he holding? A plane door handle? a red stick with a small saucepan with a bug in it? other than that… ugh my head hurts. School doesn’t help relax your brain. Imagine if biff was wearing his saturn gravity boots…or was it jupiter gravity? I’m flying soon and I’m going to think of this every time I see an emergency exit. Biff needs one of those new fangled GPS things. Wow, when Biff gets lost, he REALLY knows how to get lost. 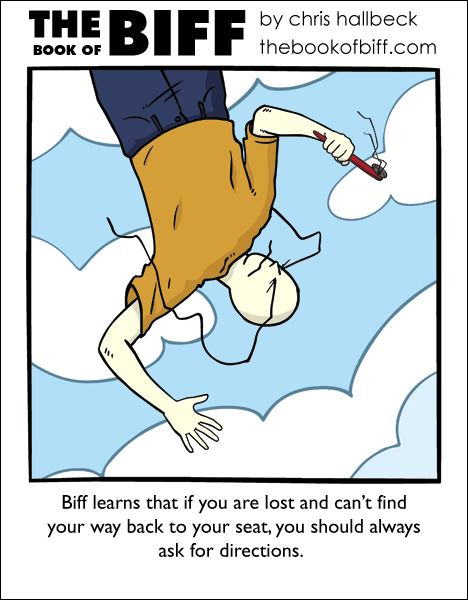 This strip was the COOLEST THING EVER until I realized that Biff was not, in fact, falling out of the sky holding a toothbrush with Biffbrows. Aw, poor Biff. Hope a Giant Squid saves him! @Gato: Someone else has heard of Lemon Demon? Wow. Great comic Chris, have you thought of doing song-inspired-week? I finally decided that the thing in Biff’s hand was a door handle, but it’s nice to know I wasn’t the only who thought it was a toothbrush. starseedjenny: I was also hoping he was holding a toothbrush with Biff eye brows. That would have been amazing. I just finished reading the archives, hilarious strip. @GuyD — Knowing Biff, the plane belongs to him, operates completely automatically, runs on ‘rainbows and unicorn farts’, and has no wings. It’s also roughly the size of Australia, and yet with Biff and all the stuff he takes with him on flights (like his Biffbrow’d toothbrush!) it’s a pretty tight fit in there. @Eleanor: I know of them as well! They’re actually relatively well known as far as I have seen. They’re awesome as well. @Gato: XD I thought of that too. Very nice one today, Chris! @everyone who knows lemon demon: they’re pretty cool, but i didn’t know they were so well known. @starseedjennny: if there aren’t any other passengers, how would biff ask for directions? oh wait – he probly has some kind of automated, voice-recognizing mapping system, which he’d probly need if the thing was the size of australia. oh and the plane would probly be fueled by something he grows (like skunk melon, since he can’t seem to sell it) (unless he breeds unicorns and rainbows on the side…). well that was longer than usual and probly too much overanalysis. but whatever. it’s a great comic. nvm – not sure why it didn’t show up the last several times i loaded the page. chris, if you’ve got a way of deleting comments, feel free to exercise it on this one and the two before it. I feel the same way about my GPS Nav. @Rick V: How old are the planes you fly on? All the new ones have EMERGENCY ONLY painted on the bathroom doors and EXIT ONLY on the exit. This one reminds me of when I was little, there was some town near us my mum took me to occasionally. But there were two different parts we went to, and I was to young to walk from one end to the other, so I would always ask which one we were going to, and why they had the same name. Your ripples on the shirt are getting better. The door handle has EYEBROWS! Maybe its a distant relative of his!